416 pages | 21 B/W Illus. Climate change and increased climate variability in terms of rising temperatures, shifting rainfall patterns, and increasing extreme weather events, such as severe drought and devastating floods, pose a threat to the production of agricultural and horticultural crops—a threat this is expected to worsen. Climate change is already affecting—and is likely to increase—invasive species, pests, and disease vectors, all adversely affecting agri-horticultural crop productivity. Advances in agricultural knowledge, science, and technology will be required to develop improved crop traits, such as temperature, drought, pest, and salt tolerance. 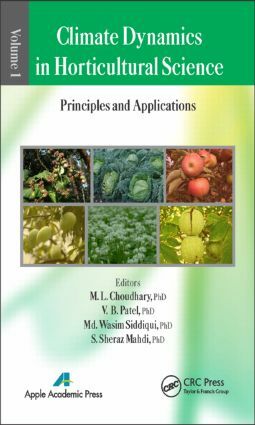 This two-volume set gives readers an understanding of the issues and makes suggestions for ways to mitigate adverse climate change effects on crops. The books are an excellent resource for researchers; instructors; students in agriculture, horticulture, environmental science, and other allied subjects; and policymakers. "Both volumes of the book are very suitable for a broad audience and address the issue head on. The volumes nicely accomplish their goals. The editors have crafted a highly accessible publication that invites readers to digest it in a single sitting, and those who take that opportunity will be pleasantly surprised. The volumes seamlessly interweave thoughts on the history of changes in weather pattern, the dynamics of climate, and its effect on horticulture. Volume 2 ventures into some of the new emerging approaches like use of nana-particles bio chart technologies, home therapy, to name a few. Is change in climate dynamics altering the horticultural scenario? Both volumes of the book agree to the fact. There is a need to protect these valuable crops for sustainability against the climate change scenario. Both volumes contribute well and raise the attention toward the serious issue regarding changes in the climate dynamics affecting horticultural scenario, supporting with strong and justifiable facts." M. L. Choudhary, PhD, is currently vice chancellor of Bihar Agricultural University in Sabour, Bhagalpur, Bihar, India. He received a master’s degree in horticulture from Banaras Hindu University, Varanasi, Utter Pradash, India, and his PhD in the USA. The government of India deputed him for an advanced study on Hi-Tech Horticulture and Precision Farming in Israel and Chile. In a career spanning 30 years, he has occupied several executive positions, including horticulture commissioner, Ministry of Agriculture, India; chairman, Coconut Development Board, Kochi (Kerala); Ministry of Agriculture, India; national project director, FAO; visiting scientist at Rutgers University, New Jersey, USA; head of the Department of Ornamental Crops, IIHR, Bangalore; and head of the Division in Floriculture at IARI, New Delhi. As horticulture commissioner of the Ministry of Agriculture, India, he conceived, conceptualized, and implemented flagship programs such as the National Horticulture Mission and the National Bamboo Mission and Micro-irrigation. Apart from his professional career, he was also chairman and member secretary of various committees constituted by the government of India as well as state governments. He has guided 18 PhD students and 21 MSc students in the field of horticulture and has published 124 book chapters, 19 books, and 109 research papers of national and international repute. Dr. Choudhary has represented India at various international forums in the capacity of chairman and member. He was also the chairman of the Codex Committee of the Scientific Committee for Organic Standard of Ministry of Commerce. He has been conferred with 15 awards from various scientific and nonscientific organizations and government committees for his outstanding contribution in the field of horticulture/floriculture. He has also been awarded the Fellowship of Horticultural Society of India. Dr. Choudhary in his 30 years of academic, research, and administrative career has visited more than 15 countries to participate in various professional meetings. V. B. Patel, PhD, is presently working as university professor and chairman at Bihar Agricultural University, Sabour, Bhagalpur, Bihar. He has worked on developing leaf nutrient guides, nutrient management strategies, use of AMF for biohardening and stress tolerance, and a survey of indigenous germplasm of fruit crops. He developed the Leaf Sampling Technique and Standards as well as made fertilizer recommendations for several fruits. He has developed nutrient management through organic means for high-density planted mango. He has guided three MSc and one PhD students. He earned his PhD from the Indian Agricultural Research Institute, New Delhi. Dr. Patel has organized eight national/international seminars and workshops as convener, associate convener, or core team member, including Indian Horticulture Congresses, the International Seminar on Precision Farming and Plasticulture, the National Seminar on Organic Farming, Seminar on Hitech Horticulture, and National Seminar on Climate Change and Indian Horticulture. Dr. Patel has received a number of national awards and recognitions for his work in the field of horticultural research and development, including being named a Fellow of The Horticultural Society of India, New Delhi; Associate, National Academy of Agricultural Sciences (NAAS), New Delhi, India; Agricultural Leadership Award (2012) by Agricultural Today, Centre for Agricultural and Rural Development, New Delhi; Hari Om Ashram Trust Award (2007); Lal Bahadur Shastri Young Scientist Award, ICAR, New Delhi (2009); Young Scientist Award, NAAS (2005-06); Yuva Vigyanic Samman from Council of Science and Technology, Govt. Uttar Pradesh (2005); and AAAS Junior Award (2005) from the Indian Society for Plant Physiology, New Delhi. He has also received Best Research Paper/Poster paper presentation awards from different organizations. He has published 41 research papers, 16 books and bulletins, and many popular articles, among other publications. Dr. Mohammed Wasim Siddiqui is an assistant professor/scientist in the Department of Food Science and Technology, Bihar Agricultural University, India, and author or co-author of 21 peer-reviewed journal papers, 12 book chapters, and 16 conference papers. Recently, Dr. Siddiqui has initiated an international peer-reviewed journal, Journal of Postharvest Technology. He has been serving as an editorial board member of several journals. Dr. Siddiqui acquired a BSc (agriculture) from Jawaharlal Nehru Krishi Vishwavidyalaya, India. He received MSc (horticulture) and PhD (horticulture) from Bidhan Chandra Krishi Viswavidyalaya, Mohanpur, Nadia, India, with specialization in postharvest technology. He was awarded the Maulana Azad National Fellowship Award from the University Grants Commission, New Delhi, India. He has received several grants from various funding agencies to carry out his research works during his academic career. S. Sheraz Mahdi, PhD, is working as an assistant professor (agronomy) at the Bihar Agricultural University, Sabour, Bhagalpur, Bihar, with specialization in crop modeling. He worked as a research associate at the Indian Meteorological Department (IMD), Srinagar, Kashmir. He received his PhD (agronomy) from Sher-e-Kashmir University of Agricultural Sciences and Technology of Kashmir (SKUAST-K). He is the recipient of the Young Scientist Award from the Department of Science and Technology, New Delhi. He has also worked as an independent researcher in the cold arid region of Kargil Ladkh for about four years in collaboration with the Department of Agriculture, KVK-Kargil, and the Himalyan Ecological and Conservation Research Development Foundation (HECRF). He has also published more than 25 research papers and some popular articles, covering some aspects of advanced agronomy in particular.